Bikerakk is a New Zealand product - a bicycle rack made from steel and covered in a softer outer layer made from four used car tyres. The rear wheel is a glass disk that can be used for signage. To be honest, the production process seems to be a trifle overcomplicated just for a bike rack. A rubbery outer layer made of car tyres is a gimmick that doesn't serve much purpose unless you have some fancy, expensive wonderbike, which most people don't. Sheesh, if I was worried about scratches on my bicycles in this city, I would bubblewrap them and leave them in the cellar. BUT... with all that said, it's symbolism, which we like here at Copenhagenize. It's the bicycle as a symbol in cities and towns. 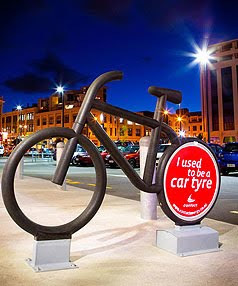 The more symbolism the better if we're to reestablish the bicycle as a feasible, respected and accepted transport form. The Bikerakk is bold and oversized which is all the better. It's a sculptural addition to the cityscape. The "I used to be a car tyre" slogan serves to push the message even further. The company who produces them is negotiating with various city councils to implement the rack. Thanks to Shane in NZ for the link to this article.